The Coeur d’Alene School District is preparing to revise the weapons policy to give school officials flexibility in how they handle students who unintentionally bring to school a pocketknife, hunting knife, water pistol or similar object and do not brandish the item or indicate they intend to do harm. 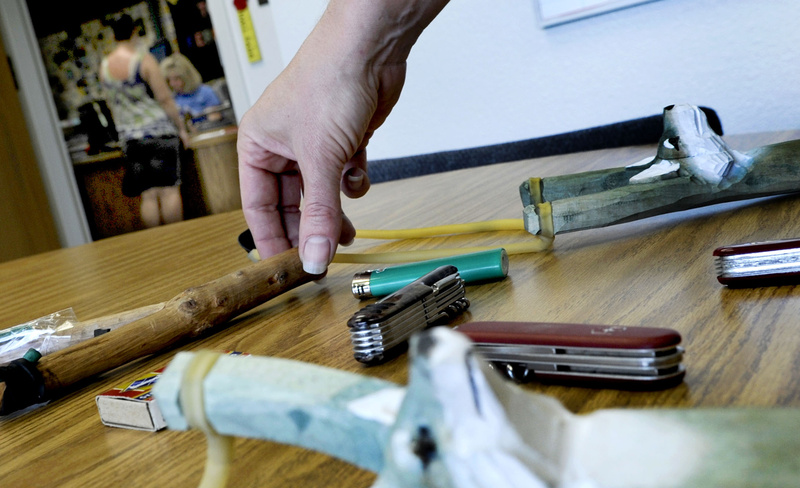 Coeur d’Alene school leaders hope to change a rigid discipline policy they say is too harsh on students who accidentally bring to school a pocketknife or something similar. Kids as young as 5 who have a small knife, perhaps left in their coat or backpack after fishing or camping with their families, are automatically suspended for five to 10 days and must go before the school board to face possible expulsion. That happens even if the student turns the knife in to a teacher or staff member. The Coeur d’Alene School Board met for 50 student disciplinary hearings this past school year, and about 20 were for incidents like these. The board immediately reinstated the students in those 20 cases, but the experience is rough on the kids and their families and is time-consuming for administrators and school trustees. The loss of classroom time is especially unfortunate, said Tom Hamilton, chairman of the school board. “The educational impact is pretty significant,” he said. The district is preparing to revise the policy to give school officials flexibility in how they handle students who unintentionally bring to school a pocketknife, hunting knife, water pistol or similar object and do not brandish the item or indicate they intend to do harm. It would be similar to how Spokane Public Schools and other Washington school districts deal with such incidents. A student who makes a threat still would go before the school board and could be expelled. And in all cases, students would still face some kind of discipline, such as an in-school suspension. Principals would consult the superintendent’s office on the proper response in each case. The existing policy is based on a state law covering weapons and facsimiles of weapons, such as toy guns. But the district’s interpretation of that law has forced many students into mandatory expulsion hearings when a less formal course of action would have sufficed, officials say. Changing the policy also could give kids more incentive to do the right thing, district leaders believe. If students know they’ll be suspended and sent before the school board even if they turn themselves in, officials worry kids will keep quiet and the knives or weapons will remain unsecured, possibly falling into the wrong hands. “One of the ways we keep schools safe is to encourage kids to tell us if there is something dangerous going on,” Interim Superintendent Matthew Handelman said, and the district does not want students to be scared to step forward or report on a classmate for fear of expulsion. The existing policy requires an immediate five-day suspension, and that extends to 10 days or longer if the district also must conduct a risk assessment of the student. That is done for all students with special needs, such as a disability, placing an additional burden on those families. Even more time may be needed to schedule the expulsion hearing, which requires three of the five trustees be present along with school administrators, the student and parents or guardians. Last November, one elementary school student missed three weeks of school before the board could meet to reinstate the child. In some cases the district is required to provide a special education teacher to meet with the child outside of school. “So we’ve spent lots of time and energy on something that potentially is absolutely no problem,” Rutherford said. The board is expected to take up the proposed policy change this summer.